The Krazy Kraft Lady: DO YOU LIKE SHISH KABOB? DO YOU LIKE SHISH KABOB? I do, but I hate having to push the meat and all the veggies onto skewers and it seems like it takes FOREVER to cook on the grill. What I do instead is pound my round steak to tenderize it then cut into bite sized pieces. I marinate this in Italian Dressing overnight. 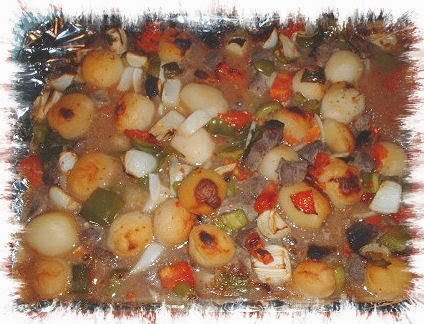 In a large bowl I add cut up green pepper, onion, tomatoes ( have also used cherry tomatoes) and several cans of whole potatoes. This also gets marinated overnight. When I'm ready to cook it, I dump it all on a foil lined cookie sheet and bake in the oven at 400 degrees until the veggies are cooked and meat is done to our liking. Every so often I will get a spatula and turn the food so the other side gets nice and browned too. You can add whatever else your family likes such as cauliflower, mushrooms, etc. That is why I let my husband make it, lol.